Shop from now until August 20, 2017 at U.S. maurices online and save money! 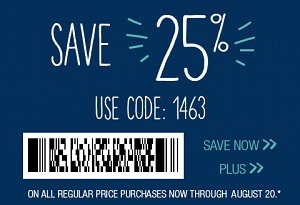 Save 25% off your online full priced purchase. Receive the offer by entering the promotion code 1463 at checkout. Source of the information is U.S. maurices. Offer is valid until August 20, 2017. For more details about the offer visit U.S. maurices online.